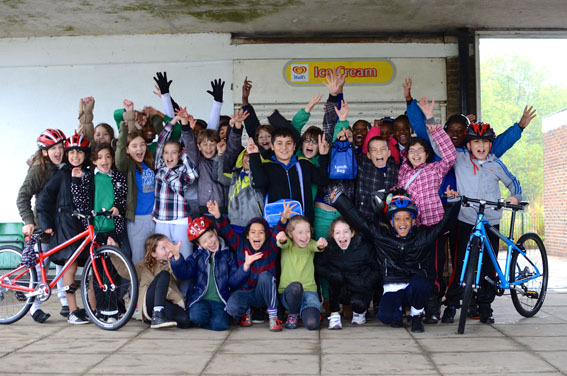 The Haringey Schools Cycling League was formed in 2012. Its objectives are to encourage an interest in cycle racing amongst primary school children, help promote a cycling culture in schools, and create opportunities for inter-school sporting competition in Haringey. Six primary schools currently take part in the HSCL: North Harringay, Chestnuts, Coleridge, Risely, St. Aidan’s and South Harringay, with more set to join in 2018-19. We’d love to hear from new schools interested – please contact us if you’d like to find out more or if you’d like us to organise a taster event at your school. Our programme of monthly race events includes grass-track racing and cyclo-cross in the spring and summer; cyclo-cross, MTB and roller-racing during the winter months. Current venues include Finsbury Park, Alexandra Palace Park, Ducketts Common, Bruce Castle Park and Chestnuts Park. We also visit specialist cycling facilities such as the Lee Valley Velopark, Redbridge Cycling Centre and the Herne Hill Velodrome. See Events for details of this year’s races. The HSCL is open to children in Years 4, 5 and 6. Children need to be competent riders but no previous racing experience is necessary. Note that the league has its own fleet of Islabikes which we bring to all events. Schools are not expected to bring their own bikes. Find out about the benefits of cycle racing and how to take part in the HSCL.